In addition, resolution 60/7 rejects any denial of the Holocaust as an historical event, either in full or in part, and commends those states which have actively engaged in the preservation of sites which served as Nazi death camps, concentration camps, forced labour camps and prisons during the Holocaust. United Nations General Assembly Resolution 61/255 adopted on 26 January 2007 also condemns any denial of the Holocaust and urges all Member States unreservedly to reject any denial of the Holocaust. United Nations Department of Public Information has embarked on a number of activities, including special events, film screenings, discussion papers from leading academics, information materials, partnerships with intergovernmental organizations and other initiatives, to encourage awareness and remind the world of the threat posed to us all when genocide and crimes against humanity are allowed to occur. At its 34th session of the General Conference in Paris in 2007, UNESCO adopted by consensus 34c/61 resolution on Holocaust Remembrance. 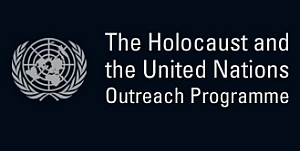 The resolution requests the Director General to consult with the United Nations Secretary-General on the programme of outreach on the subject of “the Holocaust and the United Nations”, with a view to exploring what role UNESCO could play in promoting awareness of Holocaust remembrance through education and in combating all forms of Holocaust denial. It also requests the Director-General to report the results of these consultations and his recommendations to the Executive Board at its 180th session. The two programmes complement each other: while the Holocaust and the United Nations Outreach Programme aims to mobilize civil society for Holocaust and education in order to prevent future acts of genocide, UNESCO seeks to promote Holocaust remembrance through education. Having celebrated its 10th anniversary last year, the Holocaust and the United Nations Outreach Programme remains steadfast in its mission: to help prevent future acts of genocide by reminding the world of the lessons of the Holocaust. Since its establishment by the United Nations General Assembly’s unanimous adoption of Resolution 60/7, the Holocaust Programme has carried out this mission by developing an international network of partners and a multifaceted programme. The Programme works closely with Holocaust survivors to ensure their stories are heard and heeded as a warning against the consequences of anti-Semitism and other forms of discrimination. In all of its activities, particularly with students and educators, the Programme draws crucial links between the underlying causes of genocide, the lessons to be learned from the Holocaust and the protection of human rights today. The Holocaust Remembrance Programme leads the annual observance of the International Day of Commemoration in memory of the victims of the Holocaust on 27 January. This day was chosen by the international community to mark the liberation of the Auschwitz Birkenau German Nazi Concentration and Extermination Camp (1940-1945). The theme of the 2018 ceremony in the General Assembly Hall was Holocaust Remembrance and Education: Our Shared Responsibility, which included the participation of Secretary-General António Guterres, President of the General Assembly H.E. Mr. Miroslav Lajčák; H.E. Mr. Danny Danon, Permanent Representative of Israel to the United Nations; H.E. Mr. Christoph Heusgen, Permanent Representative of Germany to the United Nations; H.E. Ms. Kelley Eckels Currie, United States Representative to the Economic and Social Council at the United Nations. Judge Thomas Buergenthal, a Holocaust survivor and a retired Judge of the International Court of Justice, Professor at George Washington University Law School served as a keynote speaker. Mrs. Eva Lavi, a Holocaust survivor, shared her testimony. The event featured recitations of memorial prayers and musical performances. In addition to the ceremony, events held at United Nations Headquarters during Holocaust remembrance week included a briefing for non-governmental organizations on Diversity and Lessons to be Learned for Human Understanding; the opening of the exhibit Survivors, Victims and Perpetrators, sponsored by Permanent Mission of Germany to the United Nations; the opening of the exhibit The Butterfly Project: Remembering the Children of the Holocaust; and a film screening Children of the Holocaust co-sponsored by Permanent Mission of the United Kingdom to the United Nations. The Holocaust Remembrance Programme has developed partnerships with civil society, educators and Governments around the world to help create multilingual educational materials, professional development programmes, exhibits and to extend its work to a global audience. The Programme continues to work with the International Holocaust Remembrance Alliance (IHRA), an intergovernmental body with 31 member countries that aims to garner political and civil society support for Holocaust education, remembrance and research both nationally and internationally. In 2016, IHRA participated in the Holocaust memorial ceremony at the United Nations in New York and a briefing on the Future of Holocaust Education that the Programme organized for non-governmental organizations. The Programme has strengthened its relationship with the United Nations Office of the Special Advisers on the Prevention of Genocide and on the Responsibility to Protect. In 2015, Mr. Adama Dieng, the Special Adviser to the Secretary-General on the Prevention of Genocide, spoke at a discussion on the role of faith and identity in the promotion of peace and in 2014 he served as a panellist at a roundtable on the United Nations War Crimes Commission Records (1943-1949). The Holocaust Remembrance Programme has developed a wide variety of educational tools in all six official languages of the United Nations in cooperation with leading institutions in Holocaust and genocide education. In 2017, it partnered with the United States Holocaust Memorial Museum in Washington, D.C. to develop a lesson plan and poster set based on the Museum’s exhibit State of Deception: The Power of Nazi Propaganda. Together with the Museum’s film, The Path to Nazi Genocide, this educational tool was provided to the global network of United Nations Information Centres for use with students in all United Nations official languages, plus Dutch, Hungarian, Kiswahili and Ukrainian. A total of 55 poster exhibits were displayed in 38 countries. The Programme also issued a student study guide, Women and the Holocaust: Courage and Compassion, and a companion DVD with survivor testimonies, in partnership with Yad Vashem, the World Holocaust Remembrance Center, and the USC Shoah Foundation Institute. For younger students, the Programme published a study guide companion to the documentary film, The Last Flight of Petr Ginz. The study guide was also issued in Czech and Portuguese by the United Nations Information Centres. The Holocaust Remembrance Programme holds events throughout the year to engage the public in discussion on the lessons of the Holocaust and contemporary dangers of hatred and prejudice. These events include a regular film series and frequent roundtables with experts in Holocaust and genocide studies. In April 2017, the Programme partnered with the Permanent Mission of Austria to the United Nations, the Austrian Cultural Forum, Facing History and Ourselves, the New York City Department of Education and the Hold onto your Music Foundation on a multimedia presentation titled The Children of Willesden Lane. Mona Golabek shared her mother Lisa Jura’s experience as a Jewish child refugee and musical prodigy, who escaped the Nazis on the Kindertransport to the United Kingdom, just before the Second World War. More than 400 middle and high school students attended the presentation. During Holocaust Remembrance Week in January 2017, the Programme screened the documentary film Persona Non Grata, which tells the story of Japanese diplomat Chiune Sugihara. Based in Lithuania during the Second World War, Sugihara risked career and family to issue transit visas which helped thousands of Jews escape. In November 2016, marking the Kristallnacht pogrom, the Programme partnered with the Permanent Missions of Ukraine and Israel to observe the 75th anniversary of the Babi Yar tragedy. At the event, Holocaust educators and scholars from Brazil, Israel, Japan, South Africa, Ukraine and the United States discussed the relationship between Holocaust remembrance, public memory, and education in their countries. In May 2016, the Programme partnered with the Primo Levi Centre in New York at an event titled After the Holocaust, Primo Levi and the Nexus of Science, Responsibility and Humanism. In November 2015, the Programme hosted a Kristallnacht discussion on Faith, Identity and the Promotion of Peace in the Aftermath of Genocide, which explored how faith and circumstances help shape an individual’s identity, influence their actions and attitudes, and can encourage the promotion of peace. The Holocaust Remembrance Programme provides ongoing support to the global network of 63 United Nations Information Centres to enable them to organize meaningful commemorative activities for the annual observance of the International Day of Commemoration in memory of the victims of the Holocaust. In 2017, these field offices held 150 Holocaust remembrance and educational activities in 50 countries. The activities range from film screenings and memorial ceremonies to youth briefings and exhibitions, many times in cooperation with Government representatives and non-governmental organizations. By translating the Holocaust Programme’s educational and information materials into local languages and involving students in their outreach efforts, the United Nations Information Centres have helped the Programme to expand its outreach to young people and achieve a global impact. A summary of these Holocaust remembrance and education activities is posted on the Programme’s website each year. Educational materials can be downloaded from the Programme’s website.